Comm Eye Health Vol. 31 No. 103 2018 pp 62. Published online 09 November 2018. Increased orbital pressure compresses the optic nerve, which can lead to irreversible vision loss in a matter of hours. What are the symptoms and signs of optic nerve compression? Inability to read colour vision plates (due to colour blindness). Soft tissue swelling. This can be due to tumours, trauma, infections or inflammation (e.g., orbital cellulitis or dysthyroid eye disease). Haematoma. Blunt or penetrating injury to the orbit may result in haemorrhage in the orbit. The resulting haematoma can compress the optic nerve. Air in the orbit. An orbital fracture can result in optic nerve compression. If a patient with an orbital fracture blows her or his nose, air may be forced from the paranasal sinus through the fracture and into the orbit, causing pressure on the optic nerve. 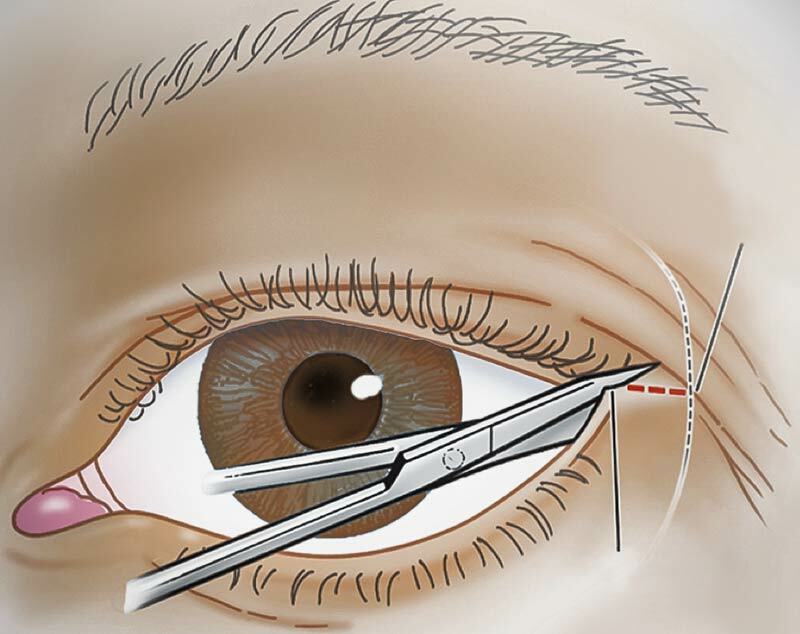 If you suspect optic nerve compression due to soft tissue swelling or a haematoma, perform a lateral canthotomy to decompress the orbit (see panel). Optic nerve compression due to soft tissue swelling may also be treated using systemic steroids. Ideally, this would be with 1 g intravenous methyl prednisolone daily for 3 days. However, if this drug is unavailable, oral prednisolone 1 mg/kg for 5 days would be a reasonable substitute. These are high doses of steroids, so it is important to watch for possible side-effects. In acute cases, you may need to aspirate blood from a haematoma. Use a 5 ml syringe and the same needle placement that is used when administering a peribulbar local anaesthetic. Patients with an orbital fracture should be instructed not to blow their nose for at least six weeks to allow the fracture to heal and to prevent optic nerve compression. If a patient does blow their nose after an orbital fracture, and they experience a sudden loss of vision in the eye, with proptosis and an afferent pupil defect, they should immediately have the orbit decompressed. Release the air in the orbit using a 5 ml syringe and the same technique that is used to aspirate blood from a haematoma. This should result in an immediate improvement in optic nerve function and vision. 5 ml syringe and 21-gauge needle to aspirate blood or air from the orbit. Leave the wound open. Repair once the intraocular pressure has decreased. 1 Risheim H, Sneve M. Bleeding behind the eye. Tidsskr Nor Legeforen 2014;134: 1854 doi: 10.4045/tidsskr.13.071. 2 Broadway D. How to test for a relative afferent pupillary defect (RAPD). Comm Eye Health 2012;25(79 & 80):58–59.